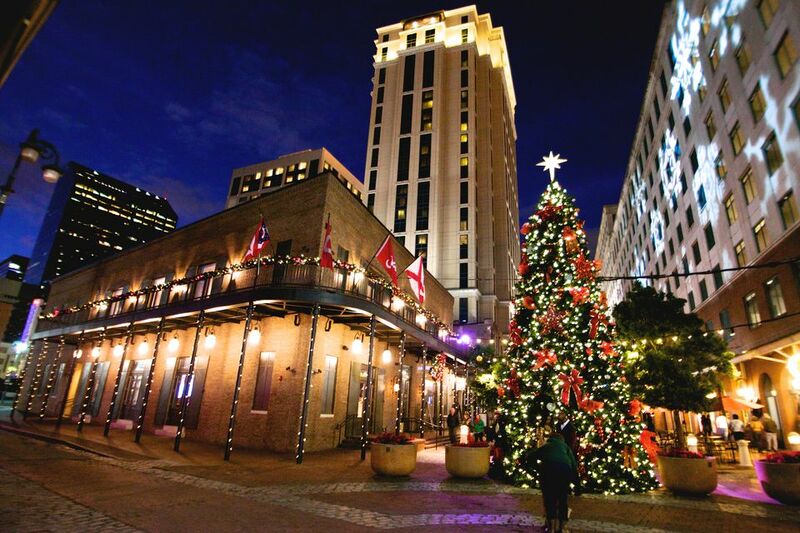 New Orleans continues its tradition of high tea during the Christmas season, offering residents and visitors alike an elegant way to spend the afternoon during the winter holidays. From the finger sandwiches to the freshly baked scones and all the trimmings, to the last delicious bite of a chocolate covered strawberry, these teas are special experiences complete with grand decorations and music to make your afternoon in NOLA even more festive. If you're planning to visit the Big Easy this December and are looking for a great tea spot for a nice afternoon treat with a flair of the festive, there's no shortage of restaurants, tea houses, and luxury hotels offering this seasonal favorite. Explore the following to find out which of New Orlean's many establishments offer guests high tea during the Christmas holidays—from the Windsor Court and Ritz-Carlton's high teas to the Teddy Bear teas of the Roosevelt and Royal Sonesta hotels, you're sure to find something everyone will enjoy on your Christmas vacation. There are a number of high-end hotels offering afternoon and high tea services to guests and passersby alike including the Windsor Court and the Ritz-Carlton, and depending on which time of the year you visit, you may even be treated to a special menu for Christmas tea service. The Windsor Court hosts a high tea all year round in Le Salon where you have a choice of the classic tea or the royal tea, which adds a glass of sherry, sparkling wine, or chardonnay and smoked salmon and caviar canapes to the usual fare. Special flavored holiday teas and Christmas cookies will be available for inclusion in the tea menu during the holiday season, and a children's menu is available with kid favorites such as peanut butter and preserves finger sandwiches, Christmas cookies, gingerbread men, and hot cocoa; be sure to book reservations in advance as seating is limited and the Windsor Court is a popular destination during the Christmas season. The Ritz-Carlton also offers a select and special menu for its standard afternoon tea during the winter months, and even features a special tea with Papa Noel. This elegant tea is for both parents and their children, and there will be music, storytelling, and a gingerbread masterpiece from the Ritz-Carlton's "Build Your Own Gingerbread House" workshops. Sandwiches, scones, and petite pastries are also on the menu. Afternoon tea takes on a new elegance at Christmas time, and it's not just for adults—several hotels offer teas especially for the younger set that parents or grandparents can enjoy equally called the Teddy Bear Tea. The Roosevelt Hotel has an elegant Teddy Bear Tea in the Crescent City Ballroom of this beautifully restored hotel. There's a kids' menu that includes hot chocolate, scones, pizza, and sandwiches, but there's also an adult menu with specialty seasonal cocktails, a wide array of teas, and a cash bar. Note, 2018 marks the 125th anniversary of Teddy Bear Tea, so expect even grander festivities. The Royal Sonesta Hotel is also hosting several Teddy Bear Royal Teas with Santa, Mrs. Claus, Frosty, and many more of your favorite holiday characters throughout the month of December, so be sure to visit their official website to find out specifics and make a reservation today. There will be story time with Mrs. Claus and a sing-a-long with Rudolph. The Beauregard-Keyes House at 1113 Chartres Street also hosts a special New Orleans Christmas tradition, the tea party for the dolls, where children may bring a favorite doll or toy and take part in a sing-a-long, listen to a story in the elegant ballroom by the old-fashioned Christmas tree, and see the resident dolls "at tea" in a Victorian dollhouse. It will be held on December 8, 2018 from 1 p.m. to 4 p.m. The Crowne Plaza New Orleans Airport Hotel also offers a holiday gingerbread tea, which, in addition to the tea and other tasty refreshments includes entertainment and children's activities. Food and drinks for parents are available also.